Awhile back I was contacted by a PR person associated with the PBS TV Program, Independent Lens. Wow! I love that show so having them contact me was pretty cool! They asked if I would like to do a review on an upcoming episode titled, "Wonder Women! 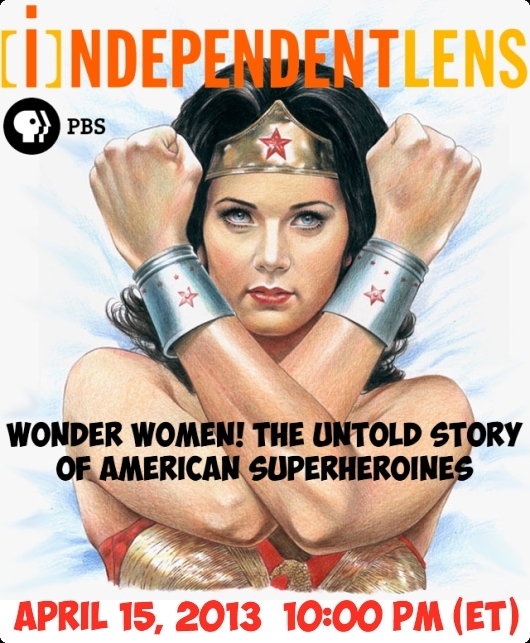 The Untold Story of American Superheroines". I have to say I was pretty surprised while watching it. I thought it was mainly just a biography on Wonder Woman. I was wrong. Yes, this episode does a really great job at telling the history of Wonder Woman: How she was created, Who created her, The comic books (from the Golden Age all the way to today ), The TV Show, etc... so if you're a WW Fan then it's pretty cool!! But the thing that surprised me was that they use the story of Wonder Woman to also celebrate many Fictional and Real-Life Women of History who have had an impact on our lives. It also sort of tells the story about the evolution of Feminism and it's all blended together very well. To close, overall I really enjoyed this episode. In fact I watched it 3 times, ha! It airs on April 15th, 2013 at 10:00 pm ( Eastern Time, Check Your Local Listings ). Watch it. You'll learn about the History of Wonder WOMEN!! Cool review. Really looking forward to this episode. Now if we could just get a WW movie!